Sure, you'd expect to find an amorphous silicon backplane behind your LCD, but RiTdisplay has now begun producing a-Si AMOLEDdisplays that, according to the company, are a world's first. 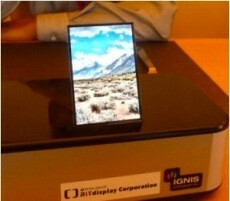 Developed in conjunction with Ignis Innovation, the 3.5-inch panel was first unveiled at last month's SID Display Week, where it beamed images in 320 x 480 resolution. RiT says its a-Si-based AMOLED screens are relatively inexpensive to produce, potentially posing an alternative to its LTPS-backplaned brethren. The company has already begun manufacturing the displays for undisclosed smartphone makers, though there's no word yet on when we can expect to see them pop up in commercial devices. But if the technology proves to be as cost-effective as RiT claims, it could go a long way toward patching up that AMOLED shortage -- as long as you're not too picky about resolution.